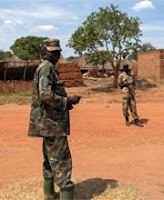 I was listening to my local NPR station the other morning and they were talking about how boys in villages in Northern Uganda were being abducted in the middle of the night a number of years ago in order to try to convince them to join their military (the Lord's Resistance Army). It certainly is an interesting way of going about getting new recruits. Anyway, somebody on the show mentioned that one of their tactics was to threaten the boys into killing someone else otherwise they would be killed themselves. Now, the first reaction I think most people would have is that they couldn't kill someone else in order to save their own life. But when you think about it, the decision isn't that cut and dry. And they weren't faking it - they'd see others killed who chose not to. The captors were, in essence, trying to turn these boys into killing machines. So, my sticky ethics question for you is: How about you? What would you do in a similar situation? What if the zombies were coming? Would you kill someone in order to save yourself? Because I would prioritize my children's lives above my own, kill or be killed is less cut and dry to me than another option: kill or have your children killed. In that case, to protect my kids, I think I'd be capable of a huge amount of justification to do the unthinkable. What we are capable of depends a huge amount on our surroundings and situations. I doubt there are very many people in the world who, if presented with situations sufficiently terrible and sufficiently compelling, would find themselves unable to take another's life. Well, it was a grim radio program. Especially for the boy who lived through it and watched his brother killed in front of a crowd of people. I have fortunately never been in the position to choose someone's life over my own (though I'm sure there's probably blood indirectly spilled somewhere in my consumer past..) I'd like to believe that I'd rather die than take a life but until the gun's in your hand and at your head, there's not much proof in that pudding. Also, I'd be totally useless in a zombie apocalypse. Alien invasion - I'd have your back and defend the planet. But zombies scare the bejeezus out of me. Kill someone or be killed? Easy answer. Be killed. But Erica brings up an interesting question. Kill or let my son be killed? I hope I would take the high road. But not entirely sure. I would hate for my son to know me as a murder. And I can't imagine not choosing for my son to live. I've spent so much time researching the Holocaust. And I know that what you can do in a situation can surprise you. And frighten and change you. But I've learned that you always kill zombies. Always. Having been in a few fights, I can say without a doubt that when my adrenaline is high, my safety is priority number one with very few exceptions (those being loved ones). I might have a a voice in the back of my head telling me how much I'd regret it later, but I'd have a later in which to regret. And with zombies, no question, time to re-dead the undead. I have a fairly strong will to live. So, yeah, if it was a kill or be killed situation I would probably kill. I may be a bit hesitant, but I would't want to die. If my children were threatened there would be no hesitation. In the case of Zombies, always kill (or re-kill as the case may be). Tough question, and I think a difficult one to answer for most people - though not for the obvious reasons. Me, I'm not a saint and I'm pretty sure I'd be *willing* to kill to save my own life in most situations, if that's really what was required. I'm just not sure I'd be *able* to pull the trigger. I think even if we can get comfortable with the moral tradeoff, we don't really understand the psychological reality that would present itself in the moment. Military trainers run into this all the time. Even trained soldiers, who have been acclimated to shooting at silhouette targets sometimes freeze up in actual combat. Not out of fear, but out of a reluctance to kill. All that aside, I'm very grateful I've never really had to confront these issues. I have an extraordinarily privileged life, and as citricsugar pointed out there's probably blood on my hands somewhere in the murky background of this western lifestyle. not to be pedantic or reactively over-sensitive, but the situation in uganda was SO much worse than your description. there are currently refugee camps full of rehabilitating child killing machines. they weren't "convinced" to join, they were forced to join. they were raped, they were brutalised, they were mutilated, and they were forced to commit some of the worst wartime atrocities in modern times. this wasn't bribery or cajoling, it was torture on individuals (children) who are incapable of making the kind of considered moral decisions that we expect adults to be able to make. there's no consent when it comes to children because they don't have free will, which makes the tactics of the LRA all the more abhorrent. Ravenfeathers is correct about the situation in Uganda. And the Ugandans didn't invent it. Like many others here; my answer to your question; it depends. Actually, Crunch, I find these answers heartening- I think it means your readers are more thoughtful than many were where we started- you remember the early days of No Impact Man? Similar, though softer, questions were posed, and many people responded with stuff like - "I'd rather die than own a gun." - deep thinkers there. Even if all that violence were to end today, I weep to think what their society will be like when those children grow up. How can that many people be so emotionally scarred and then help create and be a part of a "normal" and "civilized" society? I wonder too, what the people who are doing this to children today went through themselves when they were children. What exactly does it take to bring someone to this behaviour? Pretty sure this is not the angle you're looking for, but I think history has shown us that the urge to defend ourselves, while strong, can absolutely be overcome. Jesus didn't tell his followers to "turn the other cheek," and then not empower them to do so (if they are willing). Not that it's easy or I would condemn anyone who killed to save their family or anything. But there's something to be said for the power of making up your mind how you would react before you're in a crisis situation. On the other hand, my husband and I have agreed that if either of us turn into a zombie, and there is no possibility for a cure, we have permission to start shootin'.